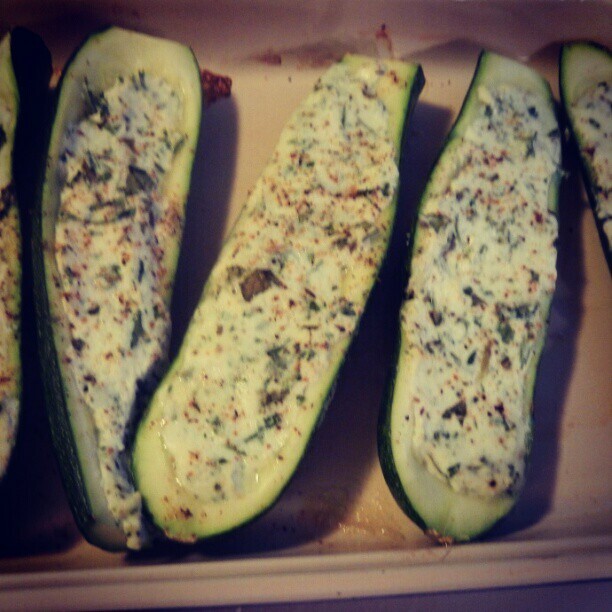 In a neverending attempt to add more vegetables into our diet, I've been researching zucchini recipes. I was trying to find something different, that didn't involve just slicing and sauteeing the zucchini. These were a great side dish - the zucchini had a nice crunch, and the savory, herb-filled filling contrasted nicely..
Slice the zucchini in half, lengthwise. Using a small spoon (I used a 1 tsp. measuring spoon) scoop out the flesh of the zucchini, leaving a 1/4 inch shell. Place the basil, ricotta, parsley, mint, Parmesan, water, lemon juice, salt and pepper in a food processor. Pulse 5-10 times until the herbs are chopped and the other ingredients are incorporated. Scoop the ricotta mixture into the zucchini shells, pressing gently. Sprinkle with seasoning blend and place in the baking dish.